Up Against It In April: Khan and Crolla Each Face One Of The Pound-For-Pound Best; But Who Has The Better Shot At Winning? Two British stars, both former world champions, face quite overwhelming odds in the month of April; and Amir Khan and Anthony Crolla will go the the lion’s den in America as they each attempt to pull off what would likely be looked at as The Upset of The Year if they managed to win. Crolla, the former WBA lightweight champ, faces the seemingly unbeatable Vasyl Lomachenko (who has actually lost a pro fight, yet is considered all but untouchable today) in Los Angeles on April 12th, while former IBF/WBA 140 pound champ Amir Khan faces the unbeaten Terence Crawford in New York on April 20th. It’s undeniable the majority of fans and experts expect Crolla and Khan to lose, most likely after a game and brave effort; but which man has the better shot at pulling off the upset win? Crolla has spoken many times of how he is up for this fight, that he has been for a while. Crolla insists that Lomachenko is not unbeatable, that he, like any and every other fighter, has flaws. It could turn out to be an intense and thoroughly engrossing chess match in L.A, and maybe Crolla, 36-6-3(13) who is experienced, battle-hardened and still young at age 32, will raise his game, box out of his skin and eke out a close decision. Maybe. Khan, the same age as Crolla, has his supporters going into the Crawford fight; people who feel that with his incredibly fast hands, Khan will be able to give Crawford major problems. 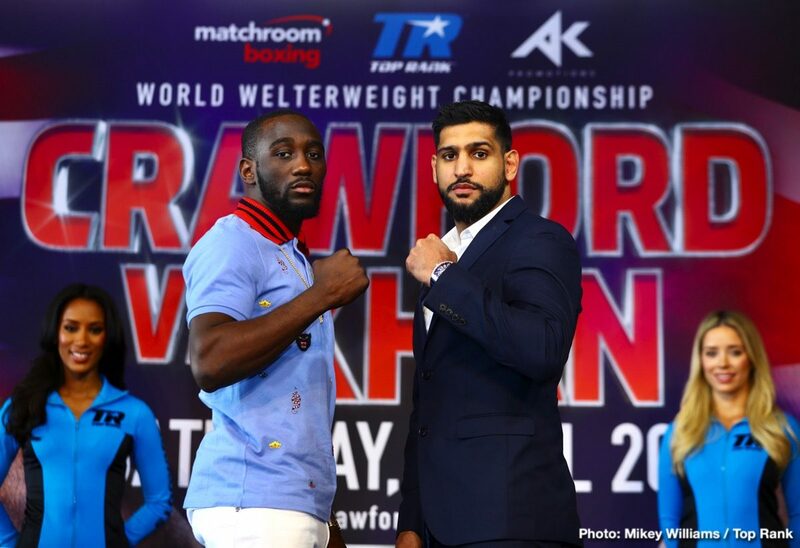 Khan insists he is the best fighter Crawford has yet faced (or will soon face), and the way smaller Yuriorkis Gamboa aside, yes, maybe Khan is right. But Crawford seems to have that special quality the, well, special ones have, and plenty of people feel Khan, 33-4(20) will take a steady hammering, perhaps a career-ending beating in New York. Khan’s chin has let him down too many times his critics say, far too many times for him to possibly be able to stand up to Crawford’s blend of speed, accuracy and spite. Crolla has been stopped himself (just once, back in 2012), yet he has shown genuine world class ability as a 135 pound fighter, and he has shown he is a durable operator. Both Crolla and Khan have a huge heart and we can really look for both men to give their all next month. But will this be enough? Crolla to get stopped in the later rounds, Khan to suffer a similar fate. Both men are getting praise for taking their upcoming challenge, and though both will be unsuccessful this praise will be doubled after a heroic effort is witnessed from both men. You are here: Home / Boxing News / Up Against It In April: Khan and Crolla Each Face One Of The Pound-For-Pound Best; But Who Has The Better Shot At Winning?